Charmel Clough with an armful of Angel Bonnets ready to be delivered to NKC Hospital’s L&D Unit. Weeks before Emilia was born, we had several baby items prepared for her birth. One of the many items was a white bonnet I had crocheted for her take home outfit. Emilia was never able to wear her bonnet home, but she was able to wear it during our hospital stay. We have several items from the hospital that hold a special place in our hearts. One of those special items is Emilia’s little white bonnet. I have been so happy to crochet little hats and bonnets that are exact replicas of Emilia’s bonnet. 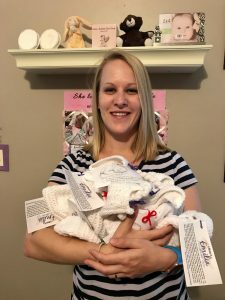 Each bonnet has been gifted to stillborn babies born at a Kansas City Hospital. I crochet all bonnets with an extraordinary amount of love and find it incredibly therapeutic as I journey through my own loss. I hope this gift provides comfort to families as they prepare to say goodbye to their precious child.